Dernford Farm lay on river terrace gravels in the Cam/Granta valley. 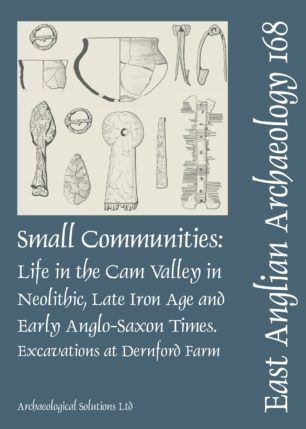 Excavation by Archaeological Solutions Ltd, in advance of gravel extraction, revealed evidence for episodic or seasonal occupation and burial in the Neolithic period. After a gap of several centuries, there were three phases of Middle Iron Age to early Roman activity representing the continuous development of the same system of enclosures focussed on a central trackway. Domestic occupation was also evident in the form of partial ring gullies. During the Conquest period there was probably a landing site for boats operating on the former river channel evident at the site. Economic activity during these phases represents a mixed, surplus-generating economy and it is possible that river traffic played an important role in the trade of the agricultural surplus. Limited finds of later Roman artefacts indicate a continued Romano-British presence in the vicinity. 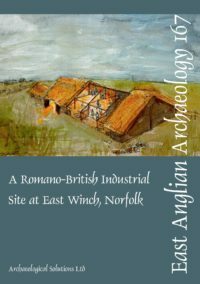 The final phase of occupation was a small rural Anglo-Saxon settlement comprising seven sunken-featured buildings and associated pits. Environmental and soil micromorphological analysis from this phase has provided important information about the internal arrangement of SFBs and the processes associated with development of their fills.